This article is about the West African religion. For other uses, see Voodoo (disambiguation). Vodun (meaning spirit in the Fon and Ewe languages, pronounced [vodṹ] with a nasal high-tone u; also spelled Vodon, Vodoun, Vodou, Voudou, Voodoo, etc.) 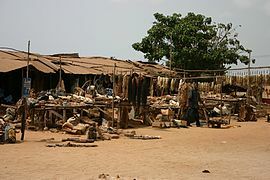 is practiced by the Fon people of Benin, and southern and central Togo; as well in Ghana, and Nigeria. It is distinct from the various traditional African religions in the interiors of these countries and is the main source of religions with similar names found among the African diaspora in the Americas, such as Haitian Vodou; Dominican Vudú; Cuban Vodú; Brazilian Vodum (candomblé jeje and tambor de mina); Puerto Rican Vudú (Sanse); and Louisiana Voodoo. 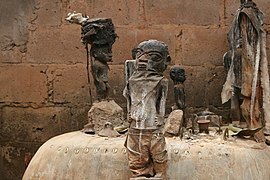 Vodun cosmology centers around the vodun spirits and other elements of divine essence that govern the Earth, a hierarchy that range in power from major deities governing the forces of nature and human society to the spirits of individual streams, trees, and rocks, as well as dozens of ethnic vodun, defenders of a certain clan, tribe, or nation. The vodun are the center of religious life. 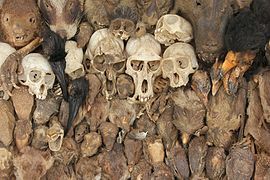 (Perceived similarities with Roman Catholic doctrines such as the intercession of saints and angels allowed Vodun to appear compatible with Catholicism, and helped produce syncretic religions such as Haitian Vodou.) Adherents also emphasize ancestor worship and hold that the spirits of the dead live side by side with the world of the living, each family of spirits having its own female priesthood, sometimes hereditary when it's from mother to blood daughter. Patterns of worship follow various dialects, spirits, practices, songs, and rituals. The divine Creator, called variously Mawu or Mahu, is a female being. She is an elder woman, and usually a mother who is gentle and forgiving. She is also seen as the god who owns all other gods and even if there is no temple made in her name, the people continue to pray to her, especially in times of distress. In one tradition, she bore seven children. Sakpata: Vodun of the Earth, Xêvioso (or Xêbioso): Vodun of Thunder, also associated with Divine Justice, Agbe: Vodun of the Sea, Gû: Vodun of Iron and War, Agê: Vodun of Agriculture and Forests, Jo: Vodun of Air, and Lêgba: Vodun of the Unpredictable. The Creator embodies a dual cosmogonic principle of which Mawu the moon and Lisa the sun are respectively the female and male aspects, often portrayed as the twin children of the Creator.Lisa is the sun god who brings the day and the heat, and also strength and energy. Mawu, the moon goddess, provides the cool of the night, peace, fertility, and rain.To give this in a summed aspect, a proverb says ‘When Lisa punishes Mawu forgives. Legba is often represented as a phallus or as a man with a prominent phallus. Known as the youngest son of Mawu, he is the chief of all Vodun divinities; in his Diasporic portrayal, Legba is believed to be a very old man who walks on crutches. Being old he is seen as wise, but when seen as a child he is one who is rebellious. It is only through contact with Legba that it becomes possible to contact the other gods, for he is the guardian at the door of the spirits. Dan, who is Mawu's androgynous son, is represented as a rainbow serpent, and was to remain with her and act as a go-between with her other creations. As the mediator between the spirits and the living, Dan maintains balance, order, peace and communication. Other popular Lwa, or spiritual entities include Azaka who rules over agriculture, Erzuli has domain over love, and Ogoun who is in charge of war, defense and who stands on guard. All creation is considered divine and therefore contains the power of the divine. This is how medicines such as herbal remedies are understood, and explains the ubiquitous use of mundane objects in religious ritual. 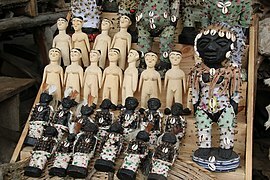 Vodun talismans, called "fetishes", are objects such as statues or dried animal or human parts that are sold for their healing and spiritually rejuvenating properties. Specifically, they are objects inhabited by spirits. The entities that inhabit a fetish are able to perform different tasks according to their stage of development. Fetish objects are often combined together in the construction of "shrines", used to call forth specific vodun and their associated powers. The Queen Mother is the first daughter of a matriarchal lineage of a family collective. She holds the right to lead the ceremonies incumbent to the clan: marriages, baptisms and funerals. She is one of the most important members of community. She will lead the women of a village when her family collective is the ruling one. They take part in the organisation and the running of markets and are also responsible for their upkeep, which is vitally important because marketplaces are the focal points for gatherings and social centres in their communities. In the past when the men of the villages would go to war, the Queen Mothers would lead prayer ceremonies in which all the women attended every morning to ensure the safe return of their menfolk. The high priestess is the woman chosen by the oracle to care for the convent. Priestesses, like priests, receive a calling from an oracle, which may come at any moment during their lives. They will then join their clan's convent to pursue spiritual instruction. It is also an oracle that will designate the future high priest and high priestess among the new recruits, establishing an order of succession within the convent. Only blood relatives were allowed in the family convent; strangers are forbidden. In modern days, however, some of the rules have been changed, enabling non family members to enter what is described as the first circle of worship. Strangers are allowed to worship only the spirits of the standard pantheon. About 17% of the population of Benin, some 1.6 million people, follow Vodun. (This does not count other traditional religions in Benin.) In addition, many of the 41.5% of the population that refer to themselves as "Christian" practice a syncretized religion, not dissimilar from Haitian Vodou or Brazilian Candomblé; indeed, many of them are descended from freed Brazilian slaves who settled on the coast near Ouidah. 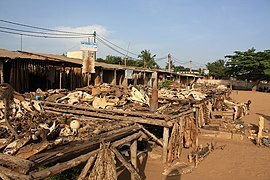 In Togo, about half the population practices indigenous religions, of which Vodun is by far the largest, with some 2.5 million followers; there may be another million Vodunists among the Ewe of Ghana, as a 13% of the total Ghana population of 20 million are Ewe and 38% of Ghanaians practise traditional religion. According to census data, about 14 million people practise traditional religion in Nigeria, most of whom are Yoruba practising Ifá, but no specific breakdown is available. 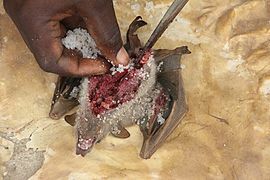 European colonialism, followed by some of the totalitarian regimes in West Africa, have tried to suppress Vodun as well as other traditional religions. However, because the vodun deities are born to each clan, tribe, and nation, and their clergy are central to maintaining the moral, social and political order and ancestral foundation of its village, these efforts have not been successful. 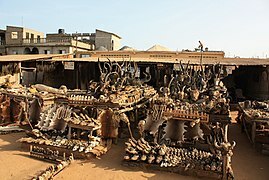 Recently there have been moves to restore the place of Vodun in national society, such as an annual International Vodun Conference held in the city of Ouidah in Benin that has been held since 1991. ^ Ojo, J.O. (1999). Understanding West African Traditional Religion. S.O. Popoola Printers. p. 63. ISBN 978-978-33674-2-5. Retrieved 16 March 2019. ^ Anthony B. Pinn (2017-10-15). Varieties of African American Religious Experience: Toward a Comparative Black Theology. Fortress Press. p. 7. ISBN 978-1506403366. ^ Anthony B. Pinn (2017-10-15). Varieties of African American Religious Experience: Toward a Comparative Black Theology. Fortress Press. p. 5. ISBN 978-1506403366. ^ Parrinder, Edward (2014). West African Religion; a Study of the Beliefs and Practices of Akan, Ewe, Yoruba, Ibo, and Kindred Peoples. Wipf & Stock. ^ Ferère, Gérard (1978). HAITIAN VOODOO: ITS TRUE FACE. Caribbean Quarterly. ^ Owusu, Heike (2003). Voodoo Rituals: a User's Guide. Sterling. ^ Kuss, Malena (2007). Music in Latin America and the Caribbean. Austin, TX: Universe of Music. ^ Landry, Timothy (2016). "Incarnating Spirits, Composing Shrines, and Cooking Divine Power in Vodún". Material Religion. 12: 50–73. doi:10.1080/17432200.2015.1120086. 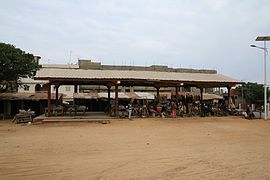 ^ a b "CIA Fact Book: Benin". Cia.gov. Retrieved 2014-08-10. ^ Oswald, Hans-Peter (2009). Vodoo. Books on Demans. Maupoil, Bernard. "La Geomancie L'ancienne des Esclaves" (Paris: L'université de Paris, 1943). 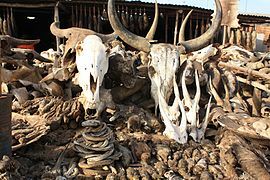 Wikimedia Commons has media related to West African Vodun.